We have been vacationing on Maui for many years and have found ourselves returning to the Sugar Beach area time and again. We love walking and jogging on the pristine beach, floating on the gentle surf, and taking in the fabulous sunsets. 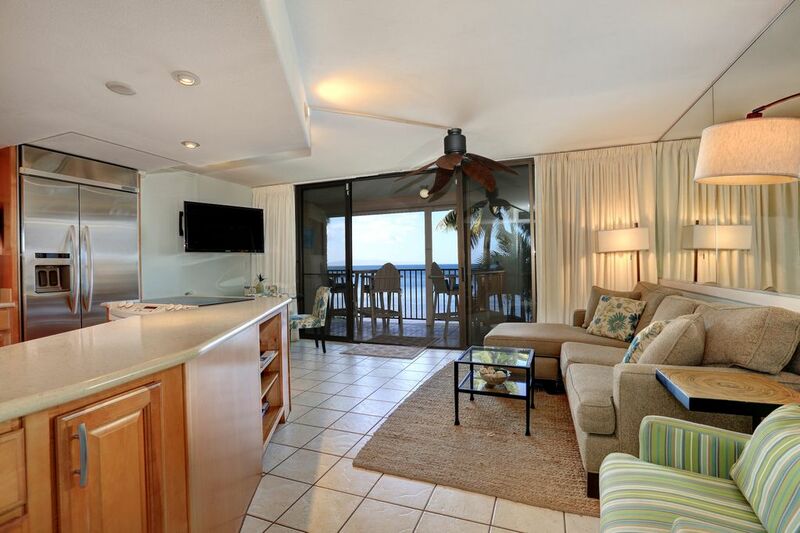 We chose to purchase a condo at Kihei Beach because it is a low density, quiet, relaxing and friendly resort. You are literally steps from the sand and that was important to us. We also enjoy the beautifully manicured grounds, palm trees, and pretty pool area. We also appreciate the convenience of a quick walk to a local Farmer's Market and ABC store. We are happy to share our little piece of paradise with you and hope you will enjoy the condo and location as much as we do. We have been vacationing on Maui for many years and have found ourselves returning to the Sugar Beach area time and again. We love walking and jogging on the pristine beach, floating on the gentle surf, and taking in the fabulous sunsets. We chose to purchase a condo at Kihei Beach because it is a low density, quiet, relaxing and friendly resort. You are literally steps from the sand and that was important to us. We also enjoy the beautifully manicured grounds, palm trees, and pretty pool area. We also appreciate the convenience of a quick walk to a local Farmer's Market and ABC store. We are happy to share our little piece of paradise with you and hope you will enjoy the condo and location as much as we do. - Mike and Michal Beth from Ketchikan, AK. Comfortable bed, gourmet kitchen, unbeatable view, close beach access, gas BBQ's, high speed (wifi) internet, putting green quality lawn, oceanfront pool, lounge chairs, free morning coffee, wireless internet in the lobby, farmers market and convenience store across the street and a canoe club right next door that rows each morning. You just can't get closer to the beach! An all ocean and beach view gives you the best taste of Hawaii. Ceiling fans in bedroom and living room. Safe Available for guest use. We came back to Maui after 40 years to celebrate our anniversary and retirement. This condo was perfect: close to everything, had all the comforts of home, and right on the water. We’ll be back for sure. The perfect place for an incredible vacation! We celebrated our 45th wedding anniversary here and I have not one criticism to say about this condo. Everything was perfect! I was quite shocked that the kitchen was so well stocked. Anything you wanted to cook had the perfect pot/pan/utensils/etc., to prepare the meal. The bed was soooo comfortable! I had a hard time getting out of it each morning. The two TV's were a nice addition. The lanai furniture was so comfortable and the high tables allowed us to have a complete view of the ocean. The condo was also stocked with paper towels, dish and laundry detergent, shampoo and bath soap. That was also a surprise to us. I recommend this condo to anyone looking for an amazing place to stay and enjoy the beautiful ocean. I really hope that we will be able to come back to this place some day. Property was great except for the furniture. Bed was broken down and lumpy. Property was great. View amazing. We would give a five star if not for the furniture. The bed was very bad. Broken down at head of bed. Mattress was very lumpy and totally uncomfortable. They need to replace the couch also. We had a hard time sitting on it without leaning to the middle. The bathrooms were beautiful. They did a good job remodeling them. They were differently a plus. Overall we enjoyed our stay there. First time on the island. Can't wait to go back. Our stay here was all we could have hope for in a place to stay for our honeymoon. Every night we slept with the patio door open and could listen to the waves crashing. The location was away from the busyness of the resorts, yet anything you wanted was just a short drive away. The pictures are very accurate. We were happy to have an in unit washer/ dryer and a coffee pot. Across the street was a nice farmers market, the best shaved ice place, and a convenience store. We aware that the birds in the trees will use your car for target practice - and a lot of it! We just spent one week in #207. It is everything as advertised and I echo the other reviewers posts. Great location, quite, with miles of beach right outside the door. The person that met us there, Scott, was very helpful and gave us a good orientation. The woman at the front desk was very polite and personable. Be sure to try the canoeing. There are canoe clubs on both sides of the property. Book an inexpensive trip, get some exercise and see that part of Maui from the water. Aloha. Salt water Aquarium 10 minutes away in Maalaea, Scuba diving nearby, walk across the street to the farmers market for fruits, vegatables and other treats or enjoy the Kihei Canoe Club practicing or competing just offshore most mornings.